This image been put in a spoiler because it's 2 MB which is above the size of images allowed in a spoiler. I think "Environment Addon" would be far more appropriate than "Environment System", though. Bringing a dead forum post back to life, but I'm implementing the darkness script in this for my game, but having a timer is a big part of the game play. I'm trying to find a way that the darkness doesn't overlap everything on the screen, but I'm having trouble trying to come up with a way. (I'm fairly new to RGSS). Is there some way I can make it so this is more compatible with other picture based scripts? I suppose it is possible if there are two images using alpha channes, to have the values of each alpha channel be added. Over my head tho. That's not needed. The Z Values in the scripts just need to be changed. I missed something in that pic the first time. It has the word "Time" in it, which looks like that is where his trouble is coming from, if I understood the post correctly. I am guessing the word "Time" is being displayed from a Picture Event. If that is the case, the Picture that displays the word "Time" has to have a higher number than the Picture that holds the Light and Shadow Effect. Line 41 under "Darkness System"
@darknes = Sprite.new; @darknes.ox, @darknes.oy, @darknes.z = 624, 624, 999Change that 999 to a smaller value. Try 199 first and experiment from there. @KK20 - Actually, that probably wouldn't work. The lower tiles on the map with high priorities would overlap the darkness. I think the smallest you can make the z value is 641, accounting for tiles with a priority of 5 on the bottom of the map. @pickedlastjake - What you actually have to do is find whatever script you're using for that hud on the bottom of your screen in the picture, go into that, and change the z of the hud. If you'll post that script, then I'll find the right line to change for you. Edit: Nevermind. 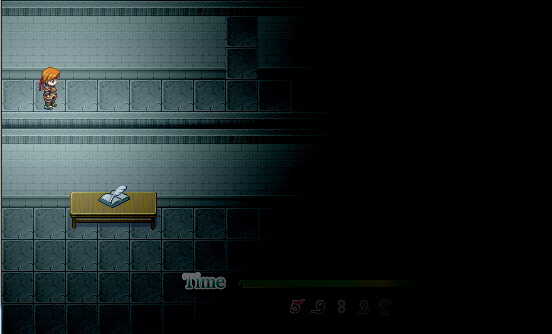 The tilemap is in it's own viewport so it doesn't matter.